Piedad de Jesus Mejia sits in a storage room at the Senda de Vida migrant shelter in Reynosa, Mexico, June 30, 2018. Mejia and her husband, Isidro Sacasa, carried a hefty clear plastic folder from their home in Honduras with medical examiner's report and death records. Mejia said she and her husband and their children fled in April after receiving death threats and seeing two cousins slain in front of their home. Other migrants are doing the same. As the Trump administration puts up more legal barriers for asylum seekers, some immigrants take steps to arrive at the border with evidence to show U.S. authorities the dangers they are trying to escape. The documents are often carried inside protective folders, and they are sometimes all that the migrants bring with them, except for the clothes on their backs. But "if it saves my children's lives, I don't mind,'' she said flatly in Spanish as she rifled through a sturdy plastic folder her husband, David, had safeguarded in a small pack containing birth certificates, proof of home ownership and the police report during the journey of more than 1,200 miles (2,000 kilometers). Mamadou Aliou Barry, who departed from his native Guinea in West Africa when he was 14, a few years ago, waits for entry to the U.S. on the Gateway Bridge in Matamoros, Mexico, which connects to Brownsville, Texas, July 3, 2018. 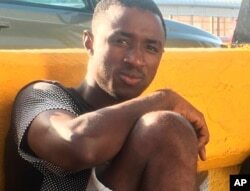 He said as part of the minority ethnic Fula group, he fears for his life and carries prints of a picture of him and a friend together and a picture of his friend after he was slain, for his asylum interview. Mamadou Aliou Barry, who departed from his native Guinea in West Africa when he was 14, a few years ago, shows a print of a selfie with his friend while waiting for entry to the U.S. on the Gateway Bridge in Matamoros, Mexico, which connects to Brownsville, Texas, July 3, 2018. 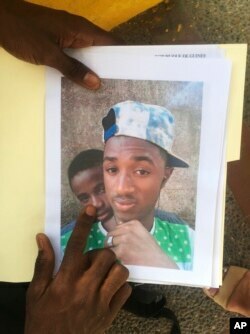 He said as part of the minority ethnic Fula group, he fears for his life and carries this picture of him and a friend together and another picture of his friend after he was slain, for his asylum interview. Another cousin, age 25, also died that day, according to his death record. A third relative, the 25-year-old man's brother, died last August at age 30, his death record showed. Asylum seekers must demonstrate a "significant possibility'' that they can prove that they have been persecuted or have a well-founded fear of persecution on grounds of race, religion, nationality, membership in a social group or political opinion if they are deported. More than three out of four asylum seekers passed the screening from October to January, according to the latest published statistics. That approval rate may fall, now that Sessions has narrowed the grounds for asylum. Why Is Reuniting Separated Families Taking So Long?